In honor of the release of The Cat and the River Thames, I’m going to let you in on a little secret. Okay. Here it is: illustrating, although fun, is very time consuming. There are so many steps for each illustration, and if I were to rush them or skip them, the picture would look…well…awful. Have you heard the news? The Cat and the River Thames is now available through RV, myself, and Amazon! Woo hoo! In celebration of the release, I made scones and tea for my family to celebrate, just like how we had shrimp and grits for the release of A New Adventure, A New Name. The scones looked so pretty, and well, tea is always pretty, so I thought that a quick photo shoot of the food with the book would be a great way to promote the book for Etsy and Facebook. This is the top of my coffee table. It is my favorite flat surface to photograph on in my entire house. The surface is this really nice stained wood, and it’s not super shiny so there aren’t big light reflection spots I have to work around. The light that comes through the window is super soft, and it’s pretty perfect for not having a “real” photo box set up. But, I have three kids. And they like to play on the coffee table. And leave things up on said table. So this momma has to work around it sometimes. And this fits my life so perfectly now with summer vacation happening. I have work I have to do, but there are musical theatre workshop camps, swim lessons, business trips to Chicago, week away camps, family vacations, and just day to day life to work around. But, we make it work. Boathouse, School, and Public Speaking, Oh My! Can I let you guys in on a little secret? Okay, so maybe hate is too strong of a word….how about I thoroughly dislike public speaking? I’m always afraid I’m going to say something wrong and make a fool out of myself, and being the center of attention is not my cup of tea. But I love my job and Boathouse Mouse more than I hate speaking in front of people. So when my son’s fourth grade teacher asked if I’d be willing to come in and talk to them and the fifth graders about being an illustrator, I jumped at the chance! It was a lot of fun visiting with the kids this morning. I spoke for about 40 minutes (which flew by!) and then there was Q&A time for about 10 – 15 minutes afterwards. I broke down each step of the process; they were surprised at how much work really goes into a book! Aaaand they may or may not have gotten to hear an excerpt from Book 2! But oh man, they were not too happy with me when I wouldn’t read any more! I had to be careful about what pictures I included; I wish I could include some pictures of the kids getting excited about Book 2, but I don’t have permission to include any kiddos in my blog. I do have permission to include the boy’s head in some of these pictures, but it also helps he belongs to me 😉 My eldest was also at the presentation, but she was my photographer extraordinaire (aka she took over 1,200 pictures!). Do you like public speaking? Give me your best tips for feeling comfortable in front of a group! And let me know if you have any questions about the illustrating/book making process! Back in November, a woman from my church approached RV and me about buying Boathouse books for a preschool class that she helps to teach. They were going to be doing an author/illustrator unit, and would love to use Boathouse as their featured book. It was exciting to hear that a school was going to be using our book for a project, and we looked forward to seeing pictures of what they did. About a week ago, Kim called me out of the blue. The school was going to be having an open house/exhibition night, and would I be interested in coming in to see the kids’ projects and hand out the books to the kids in person. It was so much fun meeting all of the kids, hearing about their favorite parts of the book, and seeing their Wanderer projects. They made little Boathouse figures, almost like a paper doll. He has his hat, his marlinspike on a cord, his tool box, boat plans, and Wanderer for them all to fit in! It’s even laminated, so the kids can play with them and not worry about them ripping. They even made an extra one for me, which I am going to frame for my office. They also drew pictures of their favorite parts of the book! Most of them loved the seagull and when Boathouse was on Wanderer. The kids and parents were all excited about having their own copies of the book; kids have been going home and talking about the book and the projects, and the parents had no reference of what book they were talking about. The principal even came in and bought a couple copies for kids in her life as she was excited about the book as well. Just seeing how loved this character and book are takes my breath away. I love being part of this project, and seeing others excited gets me all that more excited as well! However, the overall experience was a little strange. Parents were taking pictures of me talking to their kids and even having me pose with them. Kids were squealing when they met me, and I even had one little boy who kept coming back to talk about the book and was giving me hugs when he had his picture taken with me! I am just not used to that kind of attention! A huge thank you to Kim and the school for a wonderful night, it was such an honor to be invited! And stay tuned….Book 2 is close to being finished and will be available soon! Did you see RV’s Boathouse’s announcement this past weekend? It’s hard to believe that it’s been a year since I participated in my first festival as a vendor. Remember my table at this event last year? Here’s this year’s set up; I think I’ve come a long way since then! How do you know RV? How did this come about? RV is actually the dad of one of my good friends. I’d worked with him on a smaller project before (designing a logo for Mission Navigation), but nothing on this scale. RV is an author and has an awesome fiction series (seriously, you should check them out.) He emailed me late December last year with an idea for a children’s book series about a mouse who builds boats and goes on adventures, and was I interested in working with him as his illustrator. I gave it some thought (about two seconds worth) and said yes! Tonight my family is celebrating. We’re having Charleston Shrimp and Grits for dinner, and for dessert we are having Brown Sugar Cookie Bars. What are we celebrating, you may ask? Book 1 in The Adventures of Boathouse Mouse is now available for purchase!!!! WOO HOO!!!!! I’ve had a lot of people ask me how Book 1 is coming along and when the expected release date is going to be now that we’re past our original target of September. My answer? It’s coming soon! All of the final drawings took a lot longer than I expected them to. I originally thought they’d take me a week, maybe two. However, each illustration took on average 5 hours of work to complete. Considering there were 19 or 20 illustrations total, that’s about 100 hours of work around having summer vacation ending, kids going back to school, and other obligations I have. I grossly under calculated my time, and it took about 2 weeks longer than I anticipated to finish it all. I had to learn a new program for doing the book layout…and then get and learn another program. I am not technologically adept by any means. Thankfully, I have a tech guy for a husband, who learned the program quickly, then walked me through exactly what I needed to do for the book. The second program was more designed for books, and gave us the correct format for what we needed for the publisher. We decided to switch publishers. We now have a publisher that is better for illustrated books, which improves the quality of the book while keeping costs down. There was a page spacing error in our proofs. When I redid the layout when switching programs, I forgot to put a blank page in causing pages to not line up properly. The second proof is being printed right now. We’re hopeful to get the copies later this week or early next week. Once we look those over, which I think is more a formality, we can set a release date. Book 2 is going to move a long so much faster!!!! I know what I’m doing now, and I’ve been able to go back through my process for Book 1 and cut out a few steps so I should be able to move faster and more efficiently. I’ll also already know the program, and we’ll know what to look for when we do the final edit before sending to the publisher. I have Book 2 here, and will be starting my initial sketches any day now! I can’t tell you anything more than that, but I’m super excited to work on this book! Stay tuned for the official release date either here, on my Facebook page, or on RV’s website! September is just around the corner, and the anticipated projected release of A New Adventure, A New Name is quickly approaching. I am busy working on final illustrations when I can, and should be done in just a couple of weeks. However, I think I may have not thought this project through enough when I began, and it’s giving me troubles. Before you start to worry, no, I’m not wishing I hadn’t taken this project on. I’m loving it, and am eagerly awaiting working with RV on the rest of the books. Instead I’m regretting some of my illustration choices when I was working on all the initial sketches and other drafts of the pictures. In case you were wondering, that is a pile of rope. It will take up about a third of one of the illustrations. It’s not crucial to the story, just something I thought would be a nice addition to the picture. 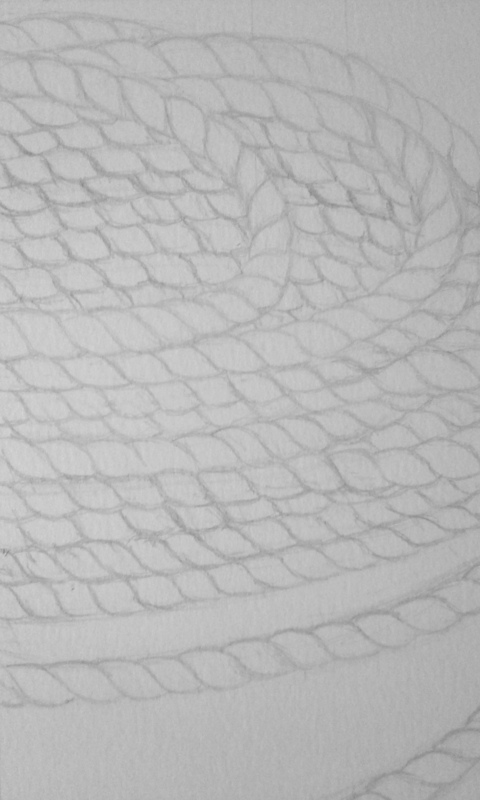 Let’s just say rope is not the easiest or fastest thing to draw. Note to self: less rope in Book 2 if possible! It does look pretty amazing when it’s drawn, though, and will look even better when colored, and that makes it all worthwhile.